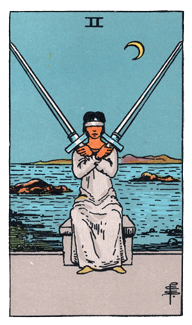 When I look at the woman in the Rider Waite Smith version of the 2 of Swords card, I imagine her being in a state of meditative calm. I see her sitting quietly in front of the big water focusing her mind and breathing in and out in a steady relaxed rhythm. Finding our own way to such calm can sometimes be a challenge, especially when our breathing is neither steady nor relaxed. That’s where power breathing can help us out. You are currently reading Power Breathing at The Tarot Room.